September 20, 2009 is a day I will never forget. It is the date of my first Search and Rescue (SAR) case as a Coast Guard pilot. I earned my Wings of Gold from Navy flight training in Pensacola, Fla., that April, and had just completed my Coast Guard transition course learning to fly the mighty MH-60J Jayhawk. I was standing my first duty. We had a routine training mission and a ports, waterways and causeways security patrol scheduled. As we were finishing our security patrol, we received a radio transmission from the air station relaying that we were to be diverted from our training to locate a missing diver. Only three weeks after completing my course, I would have a chance to put my skills to use and save someone's life. It was difficult to keep my excitement in check, but I had to focus on the task at hand. The report we received was of a missing diver 80 nautical miles west of Crystal River, nearly 120 miles from our current position. With the fuel we had remaining, we would be able to provide only an hour on scene, so we were directed to refuel in anticipation of a longer search. The weather was favorable for searching: clear skies and minimal sea state (wave height and strength). After fueling and receiving some amplifying information, we headed offshore. We arrived on scene and commenced what is known as a Victor Sierra or Sector Search, which is a search pattern used when a concentrated search is desired. We were able to narrow the scope of our search based on the information the diver's fellow boaters provided regarding the last known position of the dive boat when Mr. Smith went missing. One hour and 40 minutes from our initial notification in the aircraft, and nearly two and a half hours from the boaters' initial discovery that Mr. Smith had not surfaced where expected, we reached Mr. Smith. We located him on the second leg, only 10 minutes into our initial search. We came to a hover above the water and lowered our basket. Mr. Smith took the cue to climb into the basket with all of his gear, tank, weight belt, float bag and spear gun. Mr. Smith had left port at 4 a.m. to dive and spearfish with a few friends. He descended with 30 minutes of air in his tank and set off in search of amberjack in the middle grounds near a known wreck. Upon ascent, he saw his boat motoring away from him. He attempted to alert the crew of his location, by yelling and using a whistle, but his attempts were not heard above the engines. He even tried to muscle his way back to the boat, to no avail. Luckily, he did not go very far, and the boat did not initiate its own search without first noting the position where he should have come up. Even with the outstanding search conditions, we had not been very optimistic at our chances of a successful search. 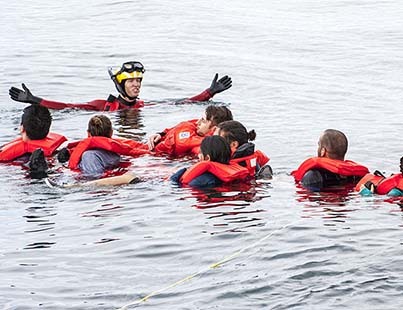 Person in the water (PIW) searches are typically extremely challenging and there are a lot of variables involved in searching for a missing person. 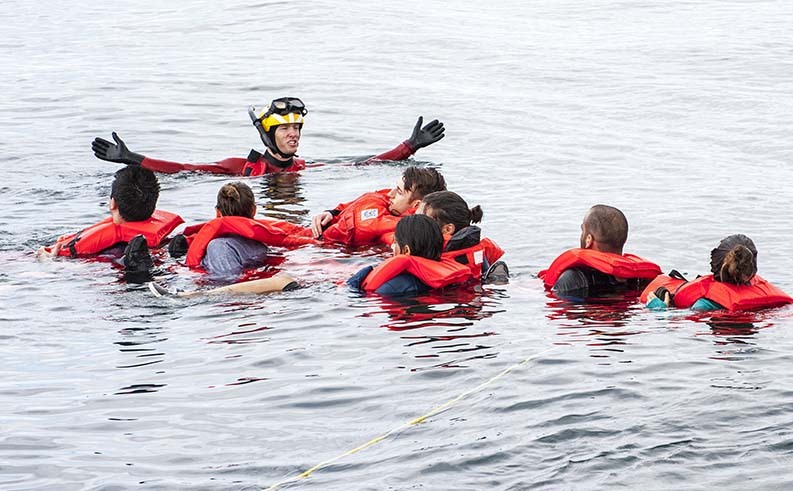 Locating a human head bobbing in the water from 300 feet away is no easy task. Imagine trying to find an object the size of a football from the distance of a football field. Then add in the challenges that this football blends into the football field and the field moves. A human head bobbing in the ocean among an assortment of fishing pot markers, seaweed, sea grass, etc., proves just as difficult. Thankfully in this case, he was relatively close the last known position and he had a brightly-colored float bag, possibly the most significant factor in his recovery. Without it, he would have been much more difficult to find. While dark wetsuits do a great job for their aquatic purposes, they don't exactly help a diver stand out in an emergency. Mr. Smith had drifted two and a half miles northwest of the originally reported position. Reporting the last known position and expected surfacing position is extremely important. It provides a starting point, but there are a lot of other factors to consider including the direction in which he swam while searching for his boat as well as the direction he drifted. When Mr. Smith was recovered, the nearest ship was over five miles away and only two boats were within 20 miles of the search area. He was very far away from any other form of assistance. This was my first rescue, and my aircraft commander Lieutenant Jamie Jenks tried to explain to me that this was an uncommonly quick and easy search. It occurred during daylight and with optimal search conditions. Anyone that lives in the southeast knows a pop up shower or thunderstorm is common and can turn the weather south fairly quickly, even if for a short amount of time. Since this search, I have been on dozens of SAR cases involving PIWs, and I have come to understand what Jenks meant. None of my subsequent searches have proved to be as simple, smooth or positive an outcome as the search for Mr. Smith. Mr. Smith was well prepared and his fellow boaters were able to provide us information to start us off in a great position to locate him. He helped save his own life by preparing a float plan and adding safety essentials to his morning checklist. There is a short list of emergency survival equipment that one should have, and they all focus on one thing – increasing your visibility in both the day and night. Some recommended items include: a brightly colored reflective float bag, sea dye markers, smoke flares as well as a light producing device, such as a strobe light or an LED to help with nighttime rescue. During a night search, the Coast Guard typically employs the aid of night vision goggles, which allow any decent source of light to be seen from a far distance. Mr. Smith's crew was also quick to respond in noting the position where he should have come up and calling the Coast Guard on Channel 16. As a boater, one of your first instincts may be to go off searching for your lost friend; however, failure to note your starting point can complicate the search and place more links in a potential error chain. When heading offshore on what should be a fun trip, being stranded in the middle of the ocean is generally not at the forefront of our minds. But with a few safety steps and a little preparation, you could just save your life. Read Helping the Rescuers: A Look at Search and Rescue or learn about DAN Boater's Search and Rescue Expense Benefit.